The beautiful Kenai Peninsula, projecting into the Gulf of Alaska between Prince William Sound and the Cook Inlet, is Alaska in microcosm. Featuring dramatic mountains and glaciers, rugged, fjordal coast line, lush spruce and hemlock forests, tens of thousands of lakes, bountiful bird and wildlife, and superb hiking and adventure activities, the Kenai is truly an outdoor lover’s paradise. 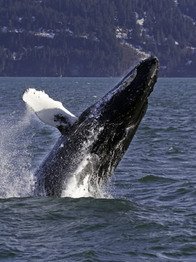 It’s only natural then that our Kenai Explorer tour is so enticing, highlighted by visits to dramatic Kenai Fjords National Park, to the lake-studded Kenai National Wildlife Refuge, and to little-visited and wildlife-rich Kachemak Bay State Park, as well as to the charming seaside Kenai Peninsula towns of Seward, Homer and Hope. 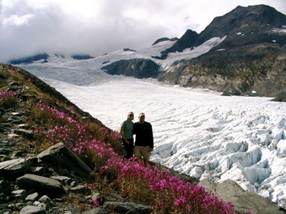 Dramatic scenery and wildlife are not the tour’s only attractions however, as Kenai Explorer also includes fantastic daily hiking and multi-sport activities. Multi-sport highlights include a wild and scenic sea kayaking day trip in beautiful Kachemak Bay State Park. Bald eagles are all about, as are lolling sea otters; whales, bears and other mammals and sea birds are also frequently sighted. A Class IV whitewater rafting trip is another unforgettable and included tour highlight! The hiking throughout this tour is especially good, with hikes alongside glaciers, through old growth rainforests, up to alpine lakes, and along beautiful beaches all part of the scheduled itinerary. A six-hour glacier and wildlife-viewing cruise through the stunning fjordlands of Kenai Fjords National Park is a highly recommended highlight. Deep-sea salmon and halibut fishing charters, and dogsled mushing on a helicopter-accessed glacier, are optionally available activities. 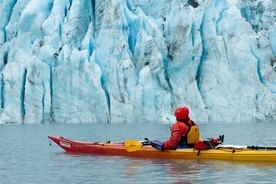 the Kenai Explorer, a beautiful tour with exhilarating multi-sport adventure activities, hiking, and glacier and wildlife-viewing opportunities, in one of Alaska’s most diverse and attractive regions.